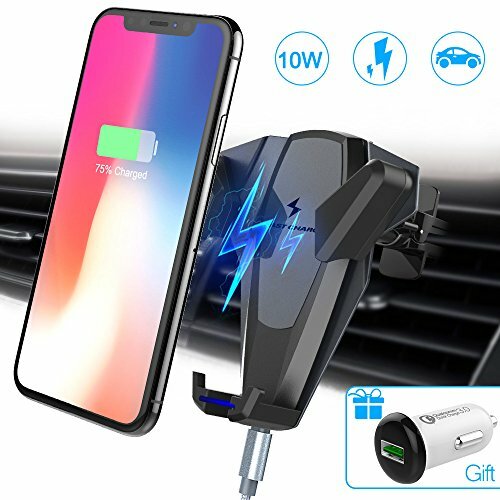 Car Wireless Charger and Car Phone Mount Holder are combined in one unit. Samsung Galaxy S9/S9+/S8/S8+/S7/S7 Edge/S6 iPhone X/8/8 Plus and Other Qi-enabled devices. 10W Fast Wireless Charger adopting the latest Qi wireless charging technology, supports 10w/7.5w/5w three wireless charging modes, suitable for different kinds of Qi-enabled smart phone. Apple, Samsung and other mainstream mobile phones that support wireless fast charging can charge 40%-50% in one hour, faster than other car wireless charger. One hand operation design and 180 degree rotation makes things so much easier when driving. The silicon-pad and innovative design of vent clip helps it tightly clamp the vent of your car, providing a safe condition for charging, GPS etc. No Worry about Slipping or Loosing. Pass the clip ball through the nut and insert it into the body screw, then insert the clip into the outlet blade and lock it to use. [Wide Compatibility& Fast Charging] Three Wireless Charging Models(5W/7.5W/10W) Compatible With iPhone X/8/8 plus and Samsung Galaxy S9/S9 plus/S8/S8 plus/S7 /S7 Edge and any other Qi-enabled smartphone. The latest 10W wireless charging technology makes phone charged faster than 5W wireless charger. The QC3.0 car charger adapter( included in package) is recommended. [One Hand Operation] Car Wireless Charger and Car Phone Mount Holder are combined in one unit. It's easy to fix your mobile phone or charge it on our Car Wireless Charger Mount through the special design with spring and Soft Rubber, and also easy to take your mobile phone out. The operation is simple with one hand, which won't distract you even when you're driving. [Humanized Design: Angle Adjustable, Aluminum Alloy Material& Space-Saving] The 180-degree rotation provides you with the best viewing angle. Foluu car wireless charger adopts Aluminum Alloy Material and Heat-Dissipation design, preventing your mobile phone from overheating and also ensuring high charging speed. The simple design makes it very simple to install on or unload from air vent, convenient to use and also helps save the space in your car. [Protective& Stable] Soft rubber is used on the grips of three sides and the vent clip, slip-proof& shock-proof, protecting your phone from damaging regardless of road vibrations or impacts. The silicon-pad and innovative design of vent clip helps it tightly clamp the vent of your car, providing a good charging environment for your phone. No Worry about Slipping or Loosing. [Service Guarantee] We are trying our best to guarantee the best shopping experience for each customer. If you have any question after purchasing our product, please contact us whenever you want. We are always there to help and we'll be happy to communicate with each customer. Our product has passed CE ROHS FCC certification. If you have any questions about this product by Foluu, contact us by completing and submitting the form below. If you are looking for a specif part number, please include it with your message.